H.J. Martin and Son has expanded its full line of services to Operable Partitions, a new branch of the company’s Walls & Ceilings division. 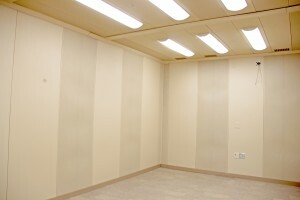 Often referred to as “movable walls,” the product adds flexibility and functionality to a wide array of public spaces. Operable Partitions commonly are utilized in hospitality venues, including hotels, convention centers, banquet halls and restaurants. They also are used in healthcare complexes and educational facilities of all levels, as well as in government, community and office buildings. 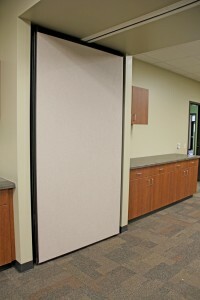 A series of interlocking, flat panels on a track, Operable Partitions offer ease of movement to adjust room size in a matter of minutes, along with acoustical features that minimize outside sound interference within the room. H.J. Martin has partnered with Panelfold®, a leading manufacturer which operates globally, and is one of four authorized installing distributors in Wisconsin, the only one in Northeast Wisconsin. The full Panelfold® product line includes folding doors, acoustical folding partitions, operable walls, relocatable walls and acoustical panel. Operable wall at Glenbrook Elementary in Pulaski, Wis.
Acoustical wall at Bayport H.S. 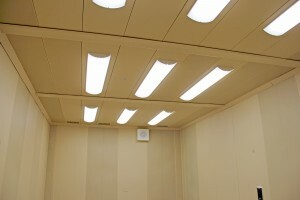 in Green Bay, Wis.
Acoustical ceiling at Bayport H.S. in Green Bay, Wis.
“More and more, our customers come to us looking for a single-source solution to their construction needs,” says H.J. Martin CEO Edward Martin. “Being able to offer Operable Partitions through our Walls & Ceilings division provides another versatile option in the building process. Operable Partitions are available with a wide selection of panel finishes and color offerings; these include textured vinyls, panel fabrics, wood veneers, vinyl hinges, rigid vinyls and high-pressure laminates. Custom sizing is another advantage of the product, along with ease of maintenance. Graig Boyle, an H.J. Martin project manager with more than a decade of experience in Operable Partitions, heads up the company’s operations in this area. He can be reached at g.boyle@hjmartin.com or (920) 490-3145. H.J. Martin, which began installing Operable Partitions in August 2015, already is scheduling installations into 2016.